← MOTHERS…One Word, Express In One Hundred Words In One Hundred Days. JOURNEY…One Word, Express In One Hundred Words In One Hundred Days. 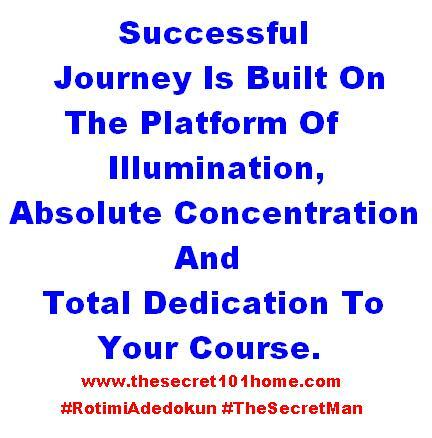 Successful Journey Is Built On The Platform Of Illumination And Absolute Concentration. You Are Not Just On A Journey But On A Mission, It Is Called Purpose. If You Are Not Serious About Life, You Are Trading Your Purpose To Your Neighbor Ask King Saul. The Secret Is That, Human Don’t Have The Capacity To Start From The End, But Have Ability To See The End. The Key Is That You Can Start From Where You Are And Get To Where You Can See. Successful Journey Is Built On The Platform Of Vision. This entry was posted in Life and Time Management, Self Development, The Secret, Vitamin Of The Mind, You! and tagged Bishop David Oyedepo, Jim Rohn, Life Is A Journey Not A Destination, Life's Journey, Pastor E A Adeboye, Rotimi Adedokun, The End From The Beginning, The Secret Of Progress. Bookmark the permalink.